Tuniac is an intuitive media player designed in the style of itunes that lets you play various audio file formats, including popular ones such as MP3, MP4, FLAC, MIDI and OGG. While the iTunes-like UI is incredibly straightforward, it doesn’t compromise on the number of advanced functions the tool can carry out. You can minimize Tuniac to the system tray during playback and while it’s maximize it can keep the computer from entering screensaver mode. Also you can set it to be always shown on top of other applications and open windows. The application can be configured to show graphic visual effects in sync with the rhythm of the audio file currently playing. It can play a large number of audio formats, including MP3, MIDI, 3GP, MP4, FLAC, OGG, AC3, TTA, MPC and WV but also radio stream. 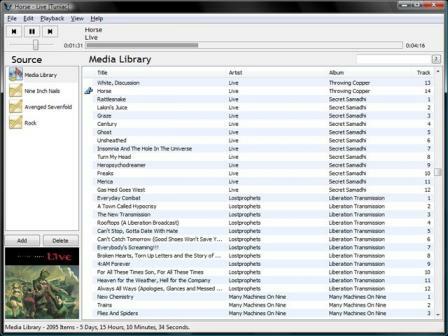 Users can import folders, files or streams into the app, as well as create playlists which can be saved or exported. While not all functions are directly visible in the UI or equipped with a shortcut button, the tool packs essential options like play, repeat, shuffle and play a random file. The sound output can be customized by tweaking the equalizer’s values as you see fit and enable crossfading for audio tracks. Lastly, Tuniac has a built-in preview function for viewing album art of audio files and it capable of showing comprehensive information for each track such as file name, artist, album title, URL, size, track genre, bitrate, BPM and channels among others.